In most Southeast Asian countries it is an indispensable practice to boil milk before consuming it. Given that we don't expect the half-life of our anti-microbial peptides to be more than a few hours , our system must be capable of producing them only when the consumer deems it necessary. Hence we decided to invoke a checkpoint in the process which precedes milk consumption i.e boiling of milk using temperature sensitive parts such as A λ pR promoter with a cI mutation and RNA thermometer. λ pR is a consituive promoter found in λ phage. It is one of the promoters that initiates the transcripion of proteins that play a role in the lytic phase of λ phage. It controls the transcripion of cell-lysis proteins, head and tail proteins. The biobrick used here contains this promoter and a mutated cI repressor protein that is the real reason for the temperature sensitvity. Below 30⁰C, the cI repressor protein is active and represses the activity of the λ pR promoter. But above 35⁰C, the activity of the repressor starts decreasing, and at 42⁰C, completely disappears. This allows enhanced transcription of the genes downstream of the λ pR promoter. 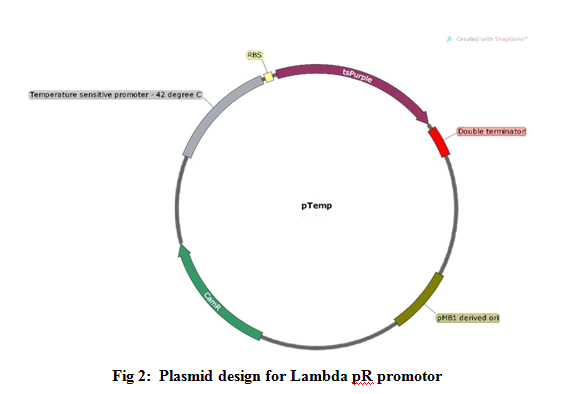 The temperature sensitive λ cI repressor protein has a cI857 mutation that results in denaturation of the repressor when the temperature is raised from 30 to 42°C, thereby allowing λ pR promoter expression. The repressor normally negatively regulates the expression of genes from the bacteriophage λ pL and pR promoters. This repressive action is strongest at 30°C. However, when the temperature is raised, typically to 42°C, the functionality of the protein is lost and the cI repressor is no longer able to bind to the operators on its promoter. Therefore, λ pR promoter expression increases. RNA-based temperature sensing is common in bacteria that live in fluctuating environments. 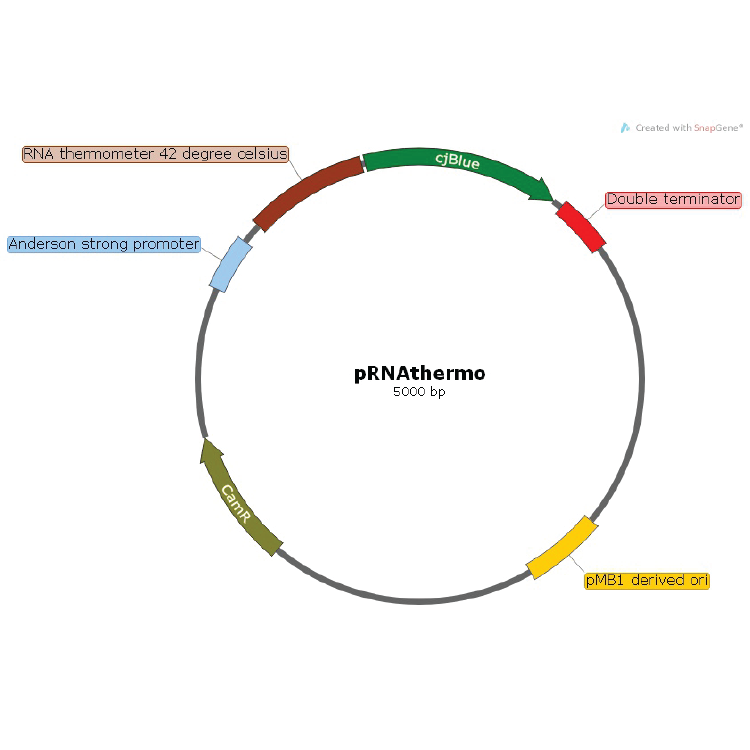 Most naturally-occurring RNA thermometers are heat-inducible, have long sequences, and function by sequestering the ribosome binding site in a hairpin structure at lower temperatures. Most naturally-occurring RNA thermometers are heat-inducible, and they function by sequestering the ribosome binding site (RBS) in a hairpin structure at low temperatures and exposing the RBS upon hairpin destabilization at high temperatures. 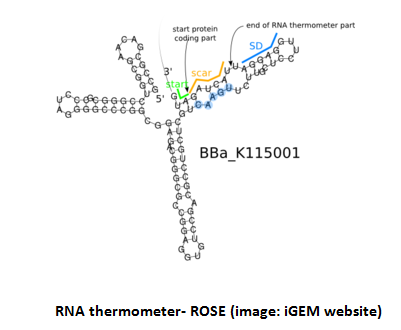 On such example of such an RNA thermometer is a regulatory element known as ROSE (Repression Of heat-Shock gene Expression) (Naberhaus.F et al). The predicted structure of the 5′ UTR sequesters not only the Shine-Dalgarno (SD) sequence but also the start codon at low temperatures.